Please click on the link below to sign up to receive the e-newsletter and to let us know how you would like us to keep in touch. By submitting this form you are confirming that you are consenting to the PCC of St Mary’s, Beverley holding and processing your personal data in order to keep you informed about church activity. Where you do not grant consent we will not be able to use your personal data; (so for example we may not be able to let you know about forthcoming services and events); except in certain limited situations, such as where required to do so by law or to protect members of the public from serious harm. You can find out more about how we use your data from our “Privacy Notice” which is available below or from the Parish Office. You can withdraw or change your consent at any time by contacting the Parish Administrator at St Mary’s Church Office, Northbar Within, Beverley or stmarys.beverley@gmail.com . Please note that all processing of your personal data will cease once you have withdrawn consent, other than where this is required by law, but this will not affect any personal data that has already been processed prior to this point. The PCC of St Mary’s, Beverley is the data controller (contact details below). This means it decides how your personal data is processed and for what purposes. 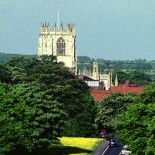 The PCC of St Mary’s, Beverley complies with its obligations under the “GDPR” by keeping personal data up to date; by storing and destroying it securely; by not collecting or retaining excessive amounts of data; by protecting personal data from loss, misuse, unauthorised access and disclosure and by ensuring that appropriate technical measures are in place to protect personal data. We retain electoral roll data while it is still current; gift aid declarations and associated paperwork for up to 6 years after the calendar year to which they relate; and parish registers (baptisms, marriages, funerals) permanently. This entry was posted on September 24, 2015 by revbecky in Uncategorized.